Staining of BN rat spleen cells with Mouse anti Rat RT1Ac (MCA156R) visualized with FITC conjugated Goat anti Mouse IgG antibody (STAR70). Staining of BN rat spleen cells with FITC conjugated Mouse anti Rat RT1Ac antibody (MCA156F). Staining of rat spleen lymphocytes with Mouse anti Rat RT1Ac antibody (MCA156GA). Mouse anti Rat MHC Class I RT1Ac antibody, clone OX-27 (MCA156R) used for the assessment of chimerism in a rat transplant model by flow cytometry. Peripheral blood multilineage chimerism in Group 5. Multilineage peripheral blood persisted for 12-13 weeks following vascularized hind-limb transplant, carried out by hind-limb transplant (HLT), at a low level in Group 5. 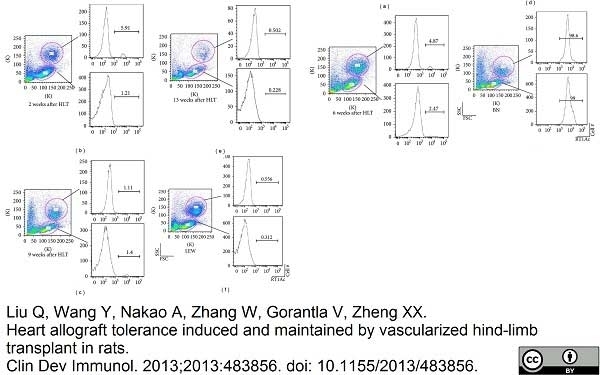 At 13 weeks following vascularized hind-limb transplant, peripheral blood chimerism could hardly be detected by flow cytometry in 5 of 6 tolerant recipients in Group 5. Clinical and Developmental Immunology, vol. 2013, Article ID 483856, 6 pages, 2013. 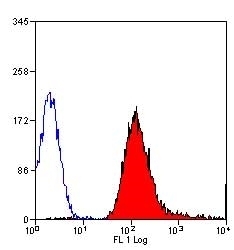 Mouse anti Rat MHC class I RT1Ac antibody, clone OX-27 (MCA156R) used for the evaluation of peripheral chimerism in a rat transplant model by flow cytometry. Dynamic changes in peripheral and myeloid chimerism. (a) Time kinetics of chimerism in groups 5 and 6. At POD 7, they showed almost the same chimerism level (P>0.05). At POD 21, the level of chimerism in group 6 was mildly decreased, but it increased sharply in group 5 (P<0.05). At POD 42, chimerism in group 5 returned to a total level 8.7%±0.6% but it decreased to background level in group 6 (P<0.05). In addition, donor-origin CD45RA+ B cells in group 5 prevailed beginning at POD 21 and maintained thereafter. (b) Myeloid chimerism was detectable at 6.3±0.5% at POD 100 in group 5 and it never appeared in group 6 when allografts were rejected (n = 6, P<0.05). 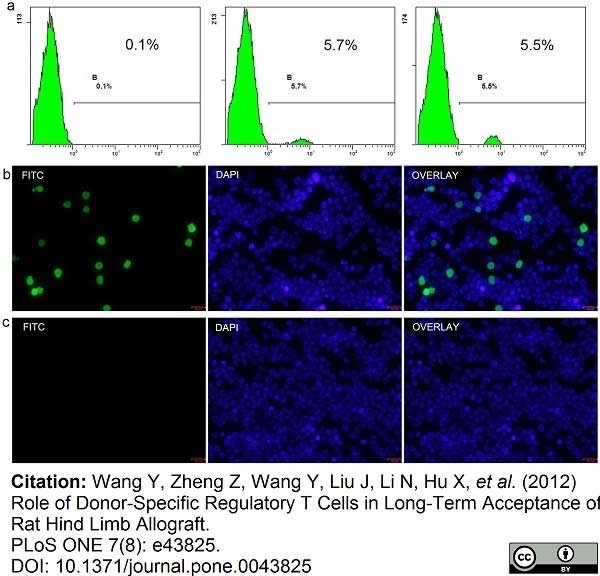 Role of Donor-Specific Regulatory T Cells in Long-Term Acceptance of Rat Hind Limb Allograft. 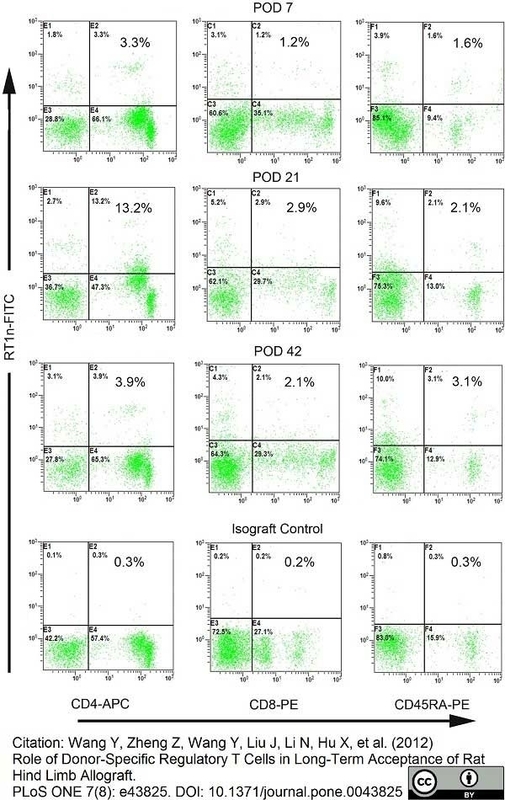 Flow cytometry analysis for myeloid chimerism and immunocytofluorescence staining for the presence of donor-origin cells in recipients' innate femurs. (a)The proportion of donor-origin cells observed from 2 representative recipients at POD 30 were at 5.7% and 5.5%, respectively, with the background level assessed at 0.1%. (b, c) The presence of RT1n cells in the contralateral femurs of recipients in group 5 and their absence in other groups was confirmed by immunocytofluorescence (×20). 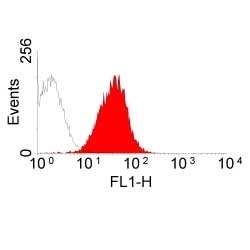 Mouse anti Rat MHC Class I RT1Ac antibody, clone OX-27 recognizes a polymorphic determinant (c haplotype) of rat Class I MHC Antigen (RT-1A). Jefferies, W.A. et al. (1985) Analysis of lymphopoietic stem cells with a monoclonal antibody to the rat transferrin receptor. Barclay, A.N. (1981) The localization of populations of lymphocytes defined by monoclonal antibodies in rat lymphoid tissues. Huang, W.C. et al. (2010) Vascularized bone grafts within composite tissue allotransplants can autocreate tolerance through mixed chimerism with partial myeloablative conditioning: an experimental study in rats. Plast Reconstr Surg. 125 (4): 1095-103. Hikita, N. et al. (1997) Use of topical FK506 in a corneal graft rejection model in Lewis rats. Invest Ophthalmol Vis Sci. 38 (5): 901-9. Sharland, A. et al. (1999) Evidence that apoptosis of activated T cells occurs in spontaneous tolerance of liver allografts and is blocked by manipulations which break tolerance. Zhu H et al. (2015) Rat model of heterotopic toe allotransplantation. J Surg Res. pii: S0022-4804(15)00283-8. Liu, Q. et al. (2013) Heart allograft tolerance induced and maintained by vascularized hind-limb transplant in rats. Clin Dev Immunol. 2013: 483856. Wang Y et al. (2012) Role of donor-specific regulatory T cells in long-term acceptance of rat hind limb allograft. PLoS One. 7 (8): e43825. von Websky, M.W. et al. (2016) Recombinant HLA-G as Tolerogenic Immunomodulant in Experimental Small Bowel Transplantation. PLoS One. 11 (7): e0158907. Gu, C. et al. (2016) Triptolide Reduces the Required Dose of Tacrolimus by Attenuating Inflammation, Enhancing Immunosuppression, and Increasing Donor Chimerism in a Heterotopic Hindlimb Transplantation Model. Plast Reconstr Surg. 138 (6): 1243-1253.